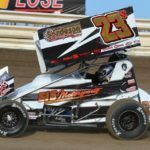 Lonnie Wheatley, BELLEVILLE, Kan. (August 3, 2018) – Arvada, Colorado’s Jake Bubak proved to be the class of the field on Friday night as the Untied Rebel Sprint Series-sanctioned Inaugural Belleville 305 Sprint Car Nationals kicked off atop the ½-mile Belleville High Banks clay oval. Bubak gunned into the lead at the outset from the front row outside and led the high-speed URSS affair all the way in the 20-lapper to take the preliminary feature winner’s share of $2,500 aboard the Coyote Candle Company No. 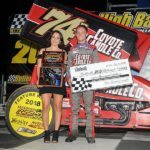 74b over a field of 49 entries, setting the stage for Saturday night’s $7,000-to-win Belleville 305 Sprint Car Nationals championship finale. 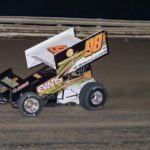 Liberal, Kansas shoe Steven Richardson earned the pole position for the main event by racking up the most points through heat and qualifying race action, but it was front row mate Bubak pouncing on the lead as the green flag flew. Weathering the race’s lone caution after five laps for Kaleb Johnson’s disabled mount in turn two, Bubak slipped away from his chasers on the restart and then ripped through lapped traffic in precise manner over the final eight circuits to secure the win. In his wake, Lincoln, Nebraska resident by way of Liberal, Jason Martin, battled into the runner-up position just ahead of Oklahoma City’s Andy Shouse. 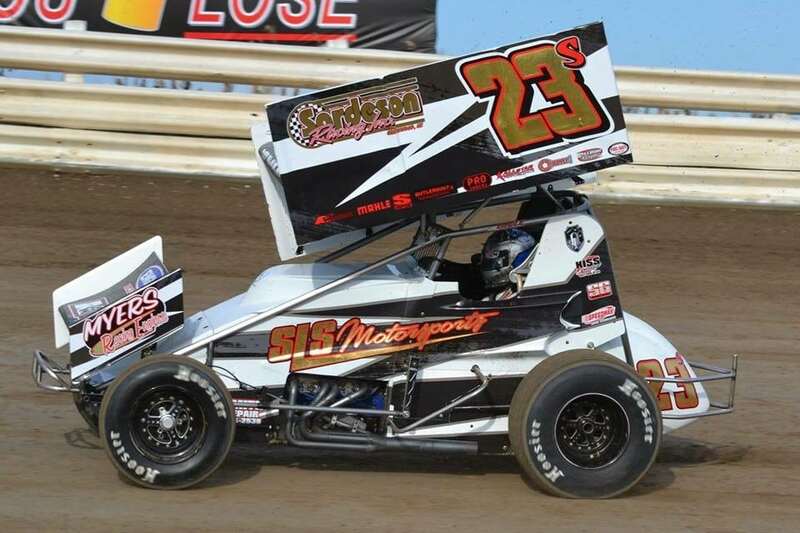 Richardson crossed the stripe in fourth with Ness City, KS, racer Luke Cranston rounding out the top five. Fort Worth’s Kevin Ramey crossed the stripe in sixth with Lorne Wofford of Alamogordo, NM, in seventh. 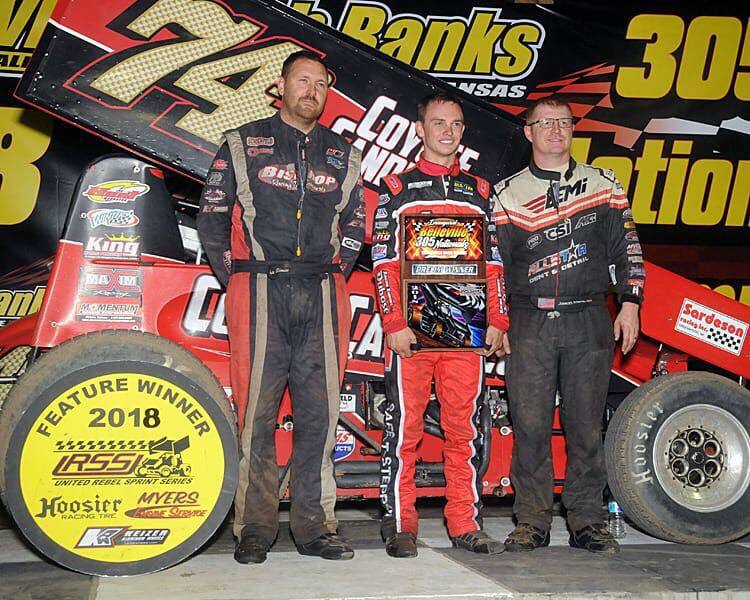 Denison, TX, rep Christian Kinnison turned in the feature’s top passing performance by rallying from 17th to eighth to earn the Keizer Wheels Hard Charger award with Nebraska’s Stu Snyder and Texas’ Dalton Stevens completing the top ten. Ray Seemann, Buddy Tubbs, Martin, Shouse, Zach Blurton and Stevens topped heat race action with Bubak, Patrick Bourke, Wes Wofford and Lorne Wofford winning the qualifying races. Kinnison and Kyle McCutcheon topped the twin 12-lap “B” Mains. The Inaugural Belleville 305 Sprint Car Nationals wraps up with Saturday night’s $7,000-to-win tilt getting under way at 7:30 p.m.
Heat One (8 Laps): 1. E85-Ray Seemann, 2. 2b-Brett Becker, 3. 11k-Tyler Knight, 4. 11x-Brandon Hanks, 5. 7-Toby Chapman, 6. 45k-Tim Crawley, 7. 69-Mike Moore, 8. 2d-Dusty Ballenger, 9. 0-Michael Scott. Heat Two (8 Laps): 1. 95-Brandon Tubbs, 2. 50-Jed Werner, 3. 49-Luke Cranston, 4. 224-Kyle McCutcheon, 5. 22-Kaleb Johnson, 6. 29s-Blake Scott, 7. 21-Brad Wasson, 8. 6-Travis Scott. Heat Three (8 Laps): 1. 5x-Jason Martin, 2. 88J-Jeremy Huish, 3. 23s-Stu Snyder, 4. 19-Wes Wofford, 5. 75-Nick Nichols, 6. 10x-Jordan Knight, 7. 55-Jack Potter, 8. V8-Robert Vetter. Heat Four (8 Laps): 1. 27-Andy Shouse, 2. 74-Patrick Bourke, 3. 911-Ty Williams, 4. 18-Lorne Wofford, 5. 7x-Shane Sundquist, 6. 9-John Webster, 7. 24-Cody Hays, 8. 48-Jake Martens. Heat Five (8 Laps): 1. 2J-Zach Blurton, 2. 74b-Jake Bubak, 3. 02-Brandon Long, 4. 7m-Kevin Ramey, 5. 9d-Lance Davis, 6. 45c-Lonnie Cox, 7. 17-Todd Plemons, 8. 33k-Aaron Ploussard. Heat Six (8 Laps): 1. 99-Dalton Stevens, 2. 0z-Steven Richardson, 3. 10-George White, 4. 82c-Christian Kinnison, 5. 28-Tracey Hill, 6. 2-Logan Payne, 7. 45-Monty Ferreira, 8. 17s-Chad Salem. Qualifier One (8 Laps): 1. 74b-Jake Bubak, 2. 0z-Steven Richardson, 3. 7x-Shane Sundquist, 4. 88J-Jeremy Huish, 5. 2b-Brett Becker, 6. 7-Toby Chapman, 7. 9d-Lance Davis, 8. 95-Buddy Tubbs, 9. 55-Jack Potter, 10. 45-Monty Ferreira, 11. 0-Michael Scott, 12. 17s-Chad Salem, 13. 10x-Jordan Knight (DNS). Qualifier Two (8 Laps): 1. 74-Patrick Bourke, 2. 11k-Tyler Knight, 3. 11x-Brandon Hanks, 4. 49-Luke Cranston, 5. 99-Dalton Stevens, 6. 22-Kaleb Johnson, 7. 6-Travis Scott, 8. E85-Ray Seemann, 9. 82c-Christian Kinnison, 10. 9-John Webster, 11. 17-Todd Plemons, 12. 45c-Lonnie Cox. Qualifier Three (8 Laps): 1. 19-Wes Wofford, 2. 5x-Jason Martin, 3. 27-Andy Shouse, 4. 48-Jake Martens, 5. 224-Kyle McCutcheon, 6. 69-Mike Moore, 7. 10-George White, 8. 2-Logan Payne, 9. 28-Tracey Hill, 10. 24-Cody Hays, 11. 911-Ty Williams, 12. V8-Robert Vetter (DNS). Qualifier Four (8 Laps): 1. 18-Lorne Wofford, 2. 23s-Stu Snyder, 3. 7m-Kevin Ramey, 4. 02-Brandon Long, 5. 2J-Zach Blurton, 6. 45k-Tim Crawley, 7. 50-Jed Werner, 8. 2d-Dusty Ballenger, 9. 75-Nick Nichols, 10. 33k-Aaron Ploussard, 11. 21-Brad Wasson, 12. 29s-Blake Scott. “B” Feature One (12 Laps): 1. 82c-Christian Kinnison, 2. 50-Jed Werner, 3. 02-Brandon Long, 4. 69-Mike Moore, 5. 45k-Tim Crawley, 6. 7-Toby Chapman, 7. 2b-Brett Becker, 8. 10-George White, 9. 75-Nick Nichols, 10. 28-Tracey Hill, 11. 55-Jack Potter, 12. 45-Monty Ferreira, 13. 45c-Lonnie Cox, 14. 21-Brad Wasson, 15. 0-Michael Scott, 16. 33k-Aaron Ploussard, 17. V8-Robert Vetter (DNS). “B” Feature Two (12 Laps): 1. 224-Kyle McCutcheon, 2. 48-Jake Martens, 3. 22-Kaleb Johnson, 4. E85-Ray Seemann, 5. 95-Buddy Tubbs, 6. 2d-Dusty Ballenger, 7. 6-Travis Scott, 8. 2-Logan Payne, 9. 9d-Lance Davis, 10. 911-Ty Williams, 11. 24-Cody Hays, 12. 9-John Webster, 13. 17-Todd Plemons, 14. 17s-Chad Salem, 15. 29s-Blake Scott (DNS), 16. 10x-Jordan Knight (DNS). “A” Main (20 Laps): 1. 74b-Jake Bubak (2), 2. 5x-Jason Martin (3), 3. 27-Andy Shouse (5), 4. 0z-Steven Richardson (1), 5. 49-Luke Cranston (8), 6. 7m-Kevin Ramey (9), 7. 18-Lorne Wofford (6), 8. 82c-Christian Kinnison (17), 9. 23s-Stu Snyder (14), 10. 99-Dalton Stevens (15), 11. 2J-Zach Blurton (10), 12. 50-Jed Werner (19), 13. 48-Jake Martens (20), 14. 69-Mike Moore (23), 15. 11k-Tyler Knight (12), 16. 88J-Jeremy Huish (13), 17. 7x-Shane Sundquist (16), 18. 74-Patrick Bourke (7), 19. 11x-Brandon Hanks (11), 20. E85-Ray Seemann (24), 21. 02-Brandon Long (21), 22. 224-Kyle McCutcheon (18), 23. 22-Kaleb Johnson (22), 24. 19-Wes Wofford (4).